Blue Mountain Bicycle Tour – SNL Jamaican Tours, Ltd. Featured in Vogue, Departure and Town & Country Magazine and seen on Discovery’s Television, Travel Channel. A must do tour while in Jamaica. Guest will travel to a cool starting point high in the Blue Mountain on a road, called by the New York times as “One of the best scenic vistas in the Caribbean”. 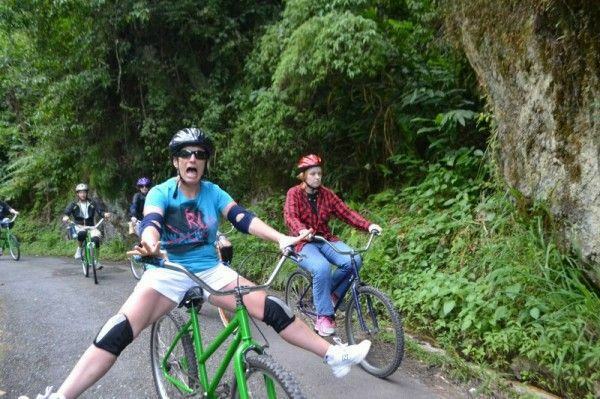 They will learn about Jamaican culture and enjoy leisure downhill bicycle ride through lush tropical rain forest, home to over hundreds of species of birds and blossoming plant life. Guests will be able to view Blue Mountain Plantations, home of the famous Blue Mountain coffee, one of the world’s most rare and expensive. The conclusion of the tour will be an exhilarating dip at a cool cascading waterfall. A simple, yet exciting way to end a dynamic and educational tour. This tour is ideal for singles, couples or families who wish to experience and photograph the world’s famous Jamaican Blue Mountains and the island culture and lush, tropical countryside – all while riding out in the fresh Jamaican air. Guests who choose not to ride are also welcome on the tour. Tour Departs From: Negril and Grand Palladium Resorts at 5:30am and return 6:00pm. Tour Departs From: Montego Bay and Falmouth Resorts at 6:00 and return at approximately 6:30 pm. • Tours are available Mondays through Saturdays. • Minimum 8 persons required for the shared tour from Negril and Grand Palladium Resorts. • Two meals provided – breakfast and lunch. • Bicycle Ride Durations -approximately 1 1/2 to 2 1/2 hours. • Bicycle Tour Distances – 9 to 18 miles downhill. • Average Group Size – 40 persons per day. • Large Group Tours -contact us for discounted group rates. • Riders – Age Seven (7) years and older. • Children under four (4) is free transportation. • Tandem Bikes available upon request.